The business model for perfume companies traditionally has been to have products manufactured and bottled in factories and then distributed to retail stores for final sale to customers. With the age of the internet came an opportunity for artisans in many fields to reach their customers directly through their own websites. Artisans can form a direct relationship with customers, which can make the interaction more satisfying all the way around. It also allows artisans to keep prices under control for their costlier handmade products by cutting out the middlemen of reps, distributors, and retailers. It helps to have your products in a few brick and mortar stores where people can try your scents, but for the most part I prefer to sell directly to customers. It’s not possible to make hundreds of thousands of bottles by hand, so if you want to keep producing handmade products you have to limit your distribution. I know other indie perfumers struggle with finding the right path too, and the answer will vary from person to person. I have taken the shopping cart buttons down temporarily so I can rest a bit and heal from a back flare-up. This time will also allow me to work on some business items that need to be researched. If you read the SF Chronicle article and my blog post about it last fall, you’ll remember that I crushed a vertebra in an accident years ago and had major back surgery with a long spinal fusion. My back flares up periodically if I sit beyond my tolerance, and the best thing for it is just to rest it to let the inflammation settle down. A few years ago I had to take an extended break (ending in March 2011), but that was different because of a family situation that was going on at the time. I don’t face anything else like that right now, so this recovery should go smoothly. I’ll also be working on the new scent formulas and taxes. I can’t wait to finish the next two natural scents. I tested the Spiced Citrus Vetiver last night and loved it; the formula is done and just needs to be scaled up and batched. If you need anything during this time, feel free to email me and I can take care of it for you. I can’t say for sure the exact date I will put the cart back up, but I am hoping it will be just a couple weeks. Thanks so much for your patience! The Elements Showcase trade show will be held in NY next week, and the Indie Fifi award winner will be announced at the show. This is the second year that the Fragrance Foundation has had an Indie category in the Fifi competition. Because perfumers nominate themselves, it’s really more of a submission process than a nomination. The submissions are then smelled and judged, resulting in a list of top five finalists. It is an honor to make the top five. Then one winner is chosen from the top five, and the award is given out at the Elements Showcase (next Monday for this year’s award). I considered whether to enter anything this year but decided against it. My two releases for 2012 were Forest Walk and Nostalgie. Forest Walk was too unusual to enter, and I worried about Nostalgie because there have been quite a few vintage-inspired scents the last few years. I did not think I could place in the finalists with either scent, though the exposure can be good just for entering. The list of entrants this year was impressive! Two favorites of many people this year were entered, Trayee by Neela Vermeire and Amber Oud by Kilian. Two of my favorite natural perfumers entered: Mandy Aftel with her Wild Roses and Ayala Moriel with her Treazon. DSH entered Le Smoking, which I haven’t tried yet but thought sounded wonderful. I’ve also heard that Lightscape by Ulrich Lang is lovely. There has been a suggestion to create an Artisan category as well, for small indie brands that are owner/perfumers who formulate and blend their own creations. It will be interesting to see if they add the new category next year. It would be wonderful to see a category for artisan indie brands whose products are handmade. The Elements show itself sounds like fun to visit, and for those of us who won’t be there, the blogs will post coverage (Fragrantica and Cafleurebon will be there, and probably others as well). Cocoa Sandalwood is now on the site! I had worried about losing some of the cocoa scent during filtration because a lot of dark waxes settle out on the filter from the cocoa, but the final result has a nice chocolate note and the edp is clear after filtration. 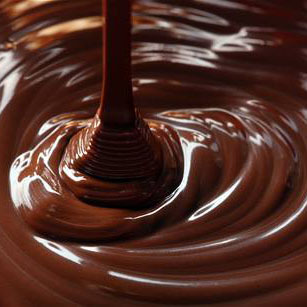 The cocoa is strongest at the start, but then it softens and lasts quite well in the background. The naturals collection will be more expensive because of the ingredients, but I’m trying to hold the price down as much as I can. I hope you enjoy trying this first scent in the collection! Here’s a summary of the number of new releases over various time periods as compared to this year, from Fragrances of the World. It is not your imagination that the number of new releases keeps skyrocketing! Last year there were 1330 total new releases, with 331 of those being niche. Ten years ago in 2002 there were 464 total new releases with 100 of those being niche. Twenty years ago in 1992 there were just 101 total new releases with 21 of those being new niche releases. If I had known nine years ago when I first started SSS that this huge niche explosion was continuing to accelerate, I would have been afraid to enter the market. This is an interesting article about the power of scent. It talks about retailers using scents to influence buying, and it also touches on other ways scent can influence behavior. Always a fascinating topic to me. I’ve been talking with UPS and FedEx to see if I can set up better rates for shipping international packages. It is hard for small businesses to qualify for good rates because we don’t ship the high volumes required for special programs. I am in touch with some people who may be able to help though, and I will know more by the end of next week. UPS does have a calculator for computing Canadian duties, so I hope to integrate that into my site and resume shipments to Canada soon. I will work on that next week too. I’ll have more shipping updates soon. I’m running behind on getting Cocoa Sandalwood on the site, but it is coming as soon as I can. Sometimes it takes me longer to do the initial batches. I’m receiving a number of inquiries from international customers. If you have a friend in the USA who can forward the shipment to you, that is not only ok but is a big help to me. I’ll post soon for the Cocoa sandalwood release, and I’ll send out a newsletter too. Happy weekend! I’m batching Cocoa Sandalwood, the first of the new Sonoma Naturals Collection, and I hope to have it on the site by the end of next week. Meantime, the first review is up on Cafleurebon, and you can head over to enter a drawing for a 17 ml bottle. After the next natural is done we’ll have a draw here too for some spray sample sets. I think this one will have appeal that overlaps my mixed media scents. Some people who like my higher sillage scents may not like this because it stays closer to the skin, but some people who find scents like Champagne de Bois too strong may like this better, and some folks will like both approaches depending on their mood and the occasion. Lasting power is excellent for me, but sillage is quiet. Those who want a strong chocolate note will have to wait for the non-alcohol version of this scent; I plan to play up the chocolate in the oil or solid version. The edp uses the cocoa to enhance the rich creamy base, but after the first 15 minutes or so the chocolate aspect of the cocoa is soft. I wanted the edp to capitalize on the creamy, buttery aspects of the sandalwood and I love how it turned out. I’m really having fun with the naturals collection and hope you’ll enjoy them too. I know this is not good news to start the new year, but I am going to suspend most international shipping for now (please read all the way through for options). Alcohol-based perfume is not supposed to ship by regular airmail in or from the USA, and regulations are becoming tighter on shipments of perfume in other countries too. In two weeks alcohol-based perfume will be illegal to ship to the UK, and it is already illegal in numerous other countries, with some being more strict about it than others (for example, Italy and Canada are strict and customs throws out perfume if they find it in packages). Alcohol-based perfume is supposed to ship by FedEx/UPS or other courier, not by regular airmail. The problem is that FedEx and UPS charge over $150 to ship to most countries from the USA, even for tiny packages. It is not worth paying the FedEx/UPS fees unless you are buying a lot of bottles in a group buy and splitting the shipping fees. As of a few months ago, all first class international usps shipments are now recorded in an online USA postal system, creating a record of every shipment along with the declared contents and value. Clearly we have bigger hazards in the USA than worrying about shipping a few bottles of perfume, much less samples, but it is a risk I shouldn’t be taking, especially given the many international orders I have been receiving lately. For those in Canada, I should soon be able to ship to Canada via UPS Standard Ground (the way Luckyscent does) and the cost is reasonable at about $18, though duties may apply depending on the value. I have already done it, but I need to get it set up on the website so that duties can be predicted ahead of time. I will continue to work on this issue, and when I add body oils and other non-alcohol products those will be easy to ship by regular mail to any country. I value my international customers very much and want to find more ways to get my products to you. Meantime, please consider the options I have mentioned. I will do as much as I can to help.